As Athens woke up this morning to the smell of burning fires and witnessed their cars covered in a fine sheet of ash, the reality of events began to settle. While i was writing yesterdays blog, politicians came out and announced that recent upgrades will ensure no power outages or restrictions and no-one had to fear the fires as everything was ready. Hours later a major power station in the region of Macedonia, overburdened by electricy demand, blew its fuses sending a casquede effect down the lines, plunging the whole of northern Greece into a blackout. 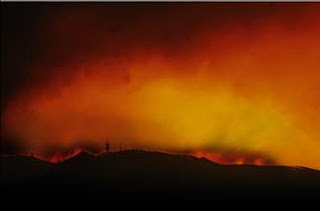 Meanwhile the fires increased in intensity and numbers jumping to over 300 flare-up according to government news media. Of the 22 fire fighting planes, only nine were capable of flying and of those, two returned to base for maintence. Politicians who were previously telling everyone that everything was under control began to realise that we were now facing the most devastating fire in a decade. People whose houses were under threat from the fires appeared on tv to plead for firefighters to make an appearance to save their homes, firefighters in turn blamed understaffing (They claim that there are 4000 positions to be filled in their ranks). 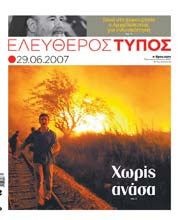 The government blamed the opposition for years of lax management. The opposition blamed the current government for not implementing any change, and the Communists... well they blamed the dominant two party system and the imperialist capitalist system and advocated a fundamental change to the political system. Meanwhile the mayor of Parnitha, home to the last vestiges of green forest in the Attica basin, Athens lungs so to speak came out and pleaded for HELP and pointed out that finger pointing can be done later, but that he needed help NOW, before it was to late. Help did come. Apparently as the firefighters shift ended last night they abandoned two water tankers, these were commandeered by some 50 volunteers, some of them army, who went out by themselves to fight the fires. Already at the sites of two fires evidence of foul play was found. At one a warning flare was found and at another a petrol jerry can with 30 shotgun shells. Some of the morning media have already pointed the finger at building companies who have been eyeing these green areas for building development for a number of years. Right now Greece is asking for help from its neighbours in fighting these fires, unfortunately when the fires are quenched i fear that the same complacency that existed before will return. Sure much finger wagging will be had, voices raised on the television and a number of good plans raised, but if those who are at fault don't step up and admit fault nothing will change. And to whom do i point and wag my finger - Well the fault is our own. Sure some can say that the government is corrupt and inneficient, or that many of the firefighters were only chosen according to whom they voted and only wanted a job where they were not expected to do anything. And those poor 'innocent' people who appeared on tv and cried for their houses to be saved, houses which were built not ten meters away from the forest (In Greece it is illegal for houses to be built any closer to 50 meters from the forest) - sure we could blame them, or even cheer at some sort of cosmic karma, but that's too easy. We are to blame because we do not DEMAND from OUR government accountability, even NGO's such as WWF who have been pointing out the lack of fire breaks and proper forest management seem to be content to just point things out but do not follow up. No one does. Partly its our own greed. "Atrocious that houses are being built where forests used to be, but if i save up, i too can own a house there..." Another part is our own complacency or lack of fight, the current system has been so ingrained in us that we don't believe we can fight it. That being said action should be done by the government, they are the only people who can legislate after all. 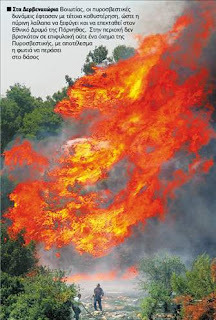 Do what Spain does, ban any building on burnt areas for 20 years, that is a first step. Do what Australia does - educate children on dealing with fires and the law. I never lived near a forest yet i know what i should look out for if i live near a forest. The forest fires are still burning, while this is tragic i hope that this will be a catalyst for change. looks like the turkish government became good in crisis management. succes over there. will be there in a week or 2..